This very enterprising and well-constructed anthology is a most interesting panorama of antipodean singers which begins close to the first syllable of recorded time and goes on to recordings made in the 1980s with four bonus tracks that take us even later. I must confess that quite a high proportion of the names here are completely new to me, though I think I will certainly not be alone in that, even among Australian buyers. It is an astonishing phenomenon that a country whose non-Aboriginal population was so small in the century between 1850 and 1950 should have produced so many singers who went on to have appreciable careers in Europe and America. In their booklet notes, Roger Neill and Tony Locantro consider this and come up with a number of interesting possible explanations. It is certainly true that the surprisingly small number of teachers who were responsible for the training of so many Australian singers were all, so to speak, members of the same family in terms of their approach to vocal technique and sound. The Garcia/Marchesi method which was common to them led to a type of sound that was very much of the type appreciated in northern Europe and the USA – a very straight tone with minimal vibrato. It is not at all surprising that very few Australian singers made any real headway in Italy, Spain or South America; the vibrant tone and flicker vibrato of singers from these areas up until the second world war was very far from Marchesi school of voice production. Unsurprisingly, the set begins with three recordings of Melba which span the whole of her recording career from the first 1904 session to the live recording of her 1926 Covent Garden Farewell. These are very well chosen to show her at her best; the Jewel Song from Faust demonstrates a trill which has no superior in any singer who recorded (and probably in no singer who ever lived), Bemberg’s “Nymphs et sylvains” shows the verve and technical accomplishment of her singing and the excerpt from La Boheme shows her as close to being emotionally engaged as any of her records do. The succeeding ten tracks demonstrate particularly clearly my earlier point about the very typically school-of-Marchesi vocal timbre of Australian sopranos, though it does become less extreme as we move into the 1920s. Frances Saville shows it at its most pure, though with a sense of the character of the role and of the singer’s own personality which not all Marchesi sopranos showed. Amy Castles’ “Caro nome” (Rigoletto) is from the same mold, but the aria is a little beyond her technique in places. By the time we reach Evelyn Scotney, though the purity is still there, there is a musicality which was far from universal in the previous generation (and I would certainly include Melba in that stricture). Particularly lovely in this section is Gertrude Johnson’s performance of Cyril Scott’s “Lullaby”. As late as 1928 in the lovely voice of Frances Alda, there is little in the way of real dramatic involvement. It is interesting to note that in the first 39 tracks of the set which include “early” in their section titles, only 14 are operatic, the rest being songs and oratorio, and this lack of operatic experience helps to explains the rather undramatic nature of the singing in these sections. Many of the operatic items are well enough sung, but distinctly placid – nicely as it is sung, I doubt that Clara Serena’s Dalila would have tempted Samson from the straight and narrow. I usually find that the song recordings are preferable with this group; they often show an involvement which the operatic items do not. Again, Melba is a prime example to my ears; her song recordings show a response to the text and situation which few of her aria recordings do. The male singers in this “early” section show the besetting sin of most Anglo-Saxon male singers of the period: a shallow tone with a lack of resonance at the top. Lionel Cecil is probably the best of the bunch, but even his voice has little richness. The basses and baritones are better than the tenors. Although its historical importance is obvious, I wish a different recording of Horace Stevens had been chosen; the distant live recording from Hereford Cathedral of an extract from Elgar’s Dream of Gerontius conducted by the composer has far too much space round the voice to allow us to hear him properly. Try to hear his Decca record of “Why do the nations?” from Messiah, it is superb. Even at the terrific lick at which it is taken, the divisions are astonishingly clean and the sense of outrage at “against the lord” is quite wonderful. Peter Dawson, of course, gets a short section all to himself, and anyone who still doubts the quality of this “popular” singer should be persuaded by this selection. I was very pleased to have the Six Australian Bush Songs by William James which demonstrate many of Dawson’s qualities very well: the clarity coupled with naturalness of his enunciation of the text, the absolute evenness of the voice throughout its range, and the ability to tell a story. The only thing not demonstrated is his florid technique, and that is on show in “Honour and arms” from Handel’s Samson which starts off his section. The next section is centred on repertoire rather than period or voice type, and demonstrates some of Australia’s excellent bigger voices with an emphasis on Wagner. What would we give today for Brünnhildes of the quality of Austral, Lawrence or the almost forgotten Elsa Stralia? The steadiness of the voices and the security of their tops are like balm to the ear after their present-day equivalents. Listen to these three and weep. The next two sections deal with music hall, variety and musical theatre, sections which, to be perfectly honest, I could have lived without, though Florrie Forde’s proto-feminist “Oh! Oh! Antonio” is still fun and it is interesting to have an 1898 example of Syria Lamonte, who was the first classical singer to be recorded in Europe. We now move to the post-war era, again starting with sopranos. Joan Hammond was a household name in Britain in the ’40s and ’50s. I have never been able to find anything exceptional in her records, though a friend who heard her several times in the ’50s in parts such as Amelia in Ballo in Maschera and Aida tells me that she was thrilling in live performance. One of the two arias included here is “O my beloved father” from Gianni Schicchi which became almost a national institution through its regular playing on the BBC right into the 1960s, but I cannot honestly find anything out of the ordinary in its fluttery tone and very genteel delivery. “Depuis le jour” (Louise) is better, but is still a very straightforward, forthright performance with little shading and none of the floated tone that the aria really needs. The following track of Glenda Raymond, a singer totally unknown to me, is better in every way with excellent coloratura, a fine trill and real sparkle. Even finer is the duet “O mon cher fils” from Berlioz’ L’Enfance de Christ sung by Elsie Morrison and John Cameron, both singers responding beautifully to the text and to Berlioz’s subtle harmonic progressions. Nance Grant’s “Du bist der Lenz” (Die Walküre) is a little placid, but her dark, mezzo-ish tone is very impressive. Rita Hunter’s “Suicidio” (La Gioconda), a passionate performance with effective use of her chest register, is an interesting change from the Wagner with which she is so associated. The post-war tenors are a varied bunch, both in style and quality. Donald Smith is really too Anglo-Saxon in sound for Malcolm’s aria from Verdi’s Macbeth, but he sings with a fine legato, though not a lot of shading. Ronald Dowd was my first Florestan in a concert performance of Fidelio in Liverpool for the Beethoven bicentenary in 1970, and his “Sanctus” from Berlioz’s Grande Messe des Morts is exactly how I remember the voice – beautiful when singing quietly but lacking real ring at the top and not always bang in tune. Ken Neate’s “Nessun dorma” (Turandot), like Smith’s Macbeth aria, does not really have the required Latin juice and warmth for this now-ubiquitous aria, though the top B is a good note. Albert Lance’s Flower Song from Carmen displays an almost comically poor French accent considering the great majority of his career was spent in Paris. His singing is dynamically undifferentiated, four-square and stolid, the very opposite of the language-based rhythmic freedom of the great French singers, though, as with Neate, his top is impressive. The final proper section, “Sutherland and her Circle”, does not begin well with John Shaw’s very blustery live performance of “Cruda funesta smanie” (Lucia di Lammermoor), but Robert Allman, another singer whom I must confess was totally unknown to me, gives a very creditable performance of “Urna fatale” (Forza del Destino) with a good legato and shapely phrasing. Clifford Grant is also fine in extracts from Massenet’s Esclarmonde and Meale’s Voss. Neil Warren-Smith displays a most impressive voice in “Tu sul labbro (Nabucco). He is listed as “bass-baritone”, but sounds like a true bass to me, and sings with excellent legato and a real feel for the aria’s contours. We finish the section, appropriately, with Sutherland in three pieces recorded between 1958 and 1960 at the start of her international career, before her singing became the consonantless vocalise that it could too often be in later years. “O luce di quest’anima” (Linda di Chamounix) is a performance of real élan and technical brilliance. In a nice touch, the final item is the aria which began the first CD, the “Jewel Song” from Faust. 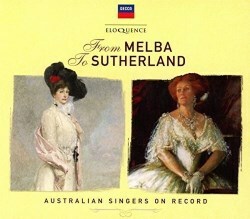 Melba and Sutherland are very different singers, though both are technically superb, but in terms of pure musicality Sutherland wins hands down, despite some marvellous details in Melba’s performance. The slightly odd “bonus” section of four sopranos contains perfectly good performances, but none seems in any way exceptional to my ears. Production values are excellent, with an informative and thoughtful article followed by very good brief biographies of all the singers. There are also photographs of the great majority of them. The discographical information for each track is also comprehensive, though I do regret the absence of matrix numbers for the tracks transferred from 78s. The actual transfers are rather more of a mixed bag. Although it is understandable that not all of the copies used were pristine, there do seem to be more tracks with distortion than I would have expected, and the 78 transfers often have a somewhat “bottled” sound which lacks clarity. The transfers are by no means bad, but they do not compare with those of, for example, Ward Marston, Seth Winner or Andrew Rose. It is a little difficult to know at whom the issue is aimed. It seems to me essentially a reference, almost an academic, set – anyone expecting simply to be able to put it on and listen to a stream of excellent performances is going to be disappointed, though there are, of course, many that are excellent. I am very glad to have it because I have a great interest in the history of singing, and it provides a good number of examples of singers unknown to me. If you share my interest in the byways of singings as well as the highroads, then there is much enjoyment to be had from this set. 5. Hilliam & McEachern: Is ’e an Aussie, Lizzie, is ’e?